Ljubljana is not a household word in America. In fact, a lot of Americans probably don’t even know where it is. So to clear things up, we’ll tell you. 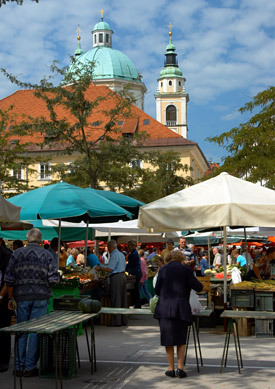 Ljubljana is the capital of Slovenia (a country that broke from the former Yugoslavia in 1991 and now has a population of just under 2,000,000). It is peaceful here, and to us, it seems like the perfect European town. As seems the case with many European capitals, a river calmly passes through the middle of the city, and this is where it all happens. Cafes and restaurants line the river and locals and visitors (mostly Europeans on a quick getaway) wile away the hours. The architecture is beautiful, the people are friendly, and the atmosphere is very relaxed. And of course, there’s a wide variety of ice cream stalls from which to choose – much to our delight, everybody seems intent on sampling them all. When you're tired of the cafe you can take a slow stroll to any of the tree-shaded parks in town. Kids and parents are dancing to live music or reading a book on one of the many benches. And the outdoor grocery market… absolutely perfect! Susan calls this “her mostest favoritest market in the world.” Considering the number of outdoor markets we’ve visited, this is quite a compliment. They have gorgeous organic produce, fresh bread, fresh-churned butter, hand-made cheeses still in their cheese cloths, and several local butcher stalls. There’s also a good selection of deli meats perfect for picnics and travel. The locals all seem to shop here (and sell here, for that matter). So while Ljubljana is not quite the secret it was 10 years ago, to us it is still the perfect little town.